First of all, thank you so much to everyone who commented (or contacted me through other means) to offer support in response to my latest post. It means the world to me, and just proves that the TOMP community is made up of some of the best people – and comic book fans – in the world! And, thanks for all the post ideas. I’m making a list of all of them and hope to get to them over the next few weeks and months, interspersed with ideas of my own, and the usual reviews and comments on whatever comes up. First on my list is to begin to tackle Daniel’s idea to look at Matt’s happier times, and that whole side of his personality. It feels like the perfect topic to lighten anyone’s mood, and it also makes for an interesting contrast with the darker side of the character. It’s interesting to note that whatever is bothering Matt Murdock at any one time, and that may be nothing at all, the answer always seems to be Daredevil. When he’s feeling low and defeated, his life as Daredevil seems to act both as a coping mechanism and a compulsion based on a (somewhat exaggerated) sense of duty. When he’s happy, that too spills over into his life as a vigilante. He clearly enjoys the physical aspects of throwing himself off high buildings and the obvious sense of accomplishment that comes from having trained his body to endure almost any situation. During the first few years of the title, being Daredevil clearly offered him a way to escape the persona of Matt Murdock, the uptight and timid blind lawyer. I’ve talked about the conflicted feelings around his identity in How Daredevil became Matt Murdock. This is interesting because it shows that even the relative carefree days of the Silver Age were not devoid of underlying conflicts. Matt may have thoroughly enjoyed playing the part of Mike Murdock, his made-up identical twin brother, and Mike may have even been a more genuine take on the underlying character. But pretending to be someone else, even as a way to manage a secret identity, is hardly the sign of great mental health. Even early in Daredevil history, there were clear signs of self-loathing and resentment. As the topic of Matt’s personality and changing moods is a pretty big, I will only be able to scratch the surface with this post, and will be doing so by going back to the very beginning of the title’s history. At the end of this post, you’ll find links to previous posts that deal with Matt’s emotional life (aside from the one’s I’ve linked to above). Altogether, that should make for a good foundation for exploring this topic further in the coming months. As origins go, I quite like the one we see in Daredevil #1. You would expect no less from someone who loves the character, but considering how weak the writing was on some of the early issues of Daredevil (Daredevil #2 anyone? ), the relative quality of the very first issue stands out. The pacing is good, it covers a lot of ground and it cleverly establishes Daredevil’s raison d’être. One interesting conflict that is apparent right from first glimpses into Matt’s early fictional life is the one between his desire for self-realization and the demands and expectations placed on him by those around him. In his early adult life, the same conflict is evident in terms of how he feels about being Daredevil, as opposed to being Matt Murdock (again, see my previous post). But this struggle pre-dates Daredevil, and even Matt’s accident. As a young boy, the source of frustration was not the need to conform to society’s expectations of a blind man, and a lawyer, but rather the strict rules laid down by his father. While young Matt is presented as a genuinely good student, one who probably would have excelled in academia even under less rigid circumstances, his strong desire to express himself physically, and play sports with the other kids, shows us another side of him aching to get out. To Matt, the Daredevil identity becomes a vehicle for action, and a way to directly address the inertia which looms whenever disaster strikes. As Matt, he is subject to the whims of others to some extent. He’s burdened by his father’s expectations, the taunts from the others at school (who misunderstand his reasons for keeping to himself and consequently mislabel him), and later by the prejudices of society. While the latter is not often touched on explicitly, it’s obvious that Matt – at least in the early days – had resigned himself to being regarded as weak. As Daredevil, he instead becomes the “actor,” his way of transforming himself from a chess piece into a player. 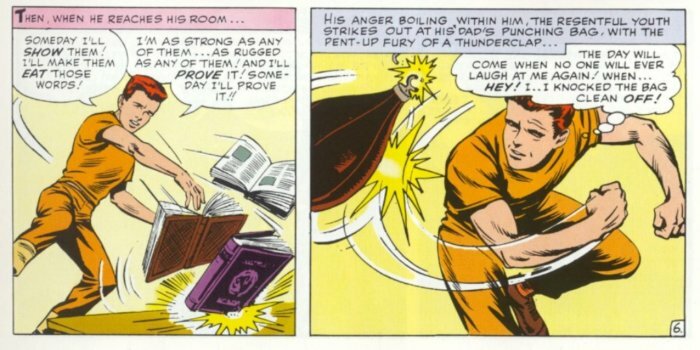 It is perhaps no coincidence that the storylines which have brought Daredevil his greatest defeats, and been the most demoralizing, are not the ones in which he is challenged physically, but the ones in which that agency is taken away from him by the manipulation and scheming of his enemies. The Daredevil identity was borne out of frustration, but is fueled by an incredible amount of optimism, sometimes bordering on over-confidence. The way Matt decides to go after his father’s killers in the very first issue clearly demonstrates his willingness to throw caution to the wind, in the hopes that his hours of training and heightened senses will be enough to carry him. He’s not certain that they will, however, and at least once he catches himself wondering whether he’s bitten off more than he can chew. This, in turn, is a behavior that will continue repeating itself over the coming decades. Matt often gets in over his head, does foolish things, and is prone to recklessness. We see him as fearless, but perhaps optimistic to the point of delusional is a better word for it. One thing is for sure, Matt Murdock needs Daredevil. He needs the physical joy of it, the power it gives him, as well as the adrenalin rush. 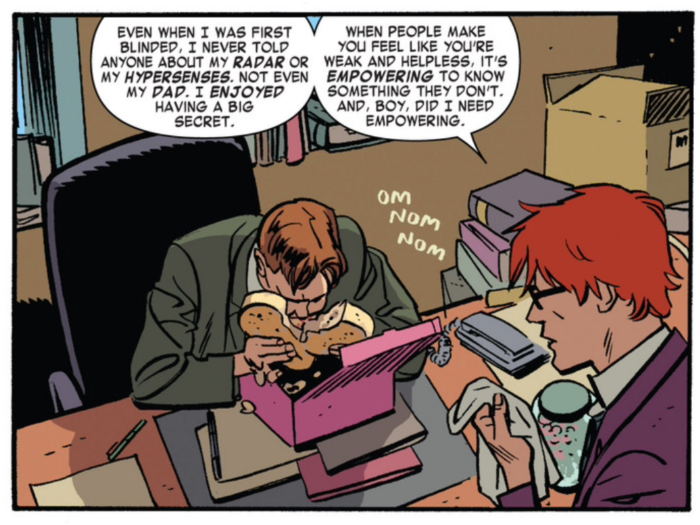 Being Daredevil is one of the best ways Matt knows to express himself when he’s happy, and it is often the only way for him to exist at all when he’s down (see much of the Brubaker/Lark run at the end of Daredevil vol 2). When you look at the entirety of the character’s life, it’s easy to see why. Great and interesting read. Even though I have no love for the silver age and think it should be ignored and forgotten, especially in Daredevil’s case, I enjoyed reading your interpretation on why Matt does what he does from his origins. Though personally I like the Miller version of who and why he is, in that yes he has a strong sense of right and wrong, but deep down he’s a crazy thrill seeker who is always on the edge of losing control and “letting the fire out.” Being a hero is just a fortunate result of circumstance and Stick forging him into a warrior. The right push in the other direction, as we’ve seen many times, would send him over the edge to become like the very villains he fights. Also, I don’t wanna sound like I’m always finding something to criticize Mark Waid for, but the panel you choose is just too perfect. It sums up everything wrong with his Daredevil run. You have this wonderfully written and insightful moment into who Matt Murdock is, all the while Foggy is slobbering down his food like Scooby-Doo. First of all I hope all is well with you and things are starting to move down a brighter path. I know we all wish you the best. Thanks for tackling the post ideas! I hope they gave you at least some inspiration. A very thoughtful and interesting introduction on my idea. I agree that when Matt is out being DD is when he is usually the happiest. As Tate, and of course Frank Miller, put it; Matt is an adrenaline junkie who likes to push things to the physical limit. There is a reason why he has a big smile on his face when he jumps off the side of a building. I really like Waid’s quote on motion. All superheroes are men, and women, of action. They don’t feel right or justified in who they are unless they are physically giving their strength and talents to help others. Im sure Matt can and does a lot of good in the court room, but he has a compulsion to physically fight corruption and crime as well. That might spin out of people’s expectations of what a blind person should be capable of and his father’s demands on him. But I think Matt has always had that defiant Irish streak in him that just wants to thumb its nose at the world and show it what he can do. Im sure you will get to this in a latter post, but its obvious that Matt has serious feelings for his dad, and thanks to resent issues his mom. Matt has a real sense of legacy; that he is a son who is carrying on the wishes and hopes of his parents. I think this motivation pushed him into law school and later to protect his neighborhood as DD. This need to live up to his father’s hopes for him is partially why he looks at his father, and his history with him, through rose colored glasses. As much as he studied and obeyed his father’s wishes, Matt still couldn’t help but immolate him. All the more reason why Matt is happiest being DD. Its because he is out being what, through his rose colored glasses, he saw his father as; a blue collar underdog using what he’s got to stand up against corruption and protect what he holds important. Matt is living up to his father’s last fight and act of rebellion. As you said, I think it is this over sense of responsibility that spawns the DD identity, and why Matt is happiest when out superheroing. That and Matt couldn’t protect his father so he feels inspired to help others that he cares about. Although I find it interesting, and this could be a topic for another post, that Matt can sometimes overstep his bounds and try to help/protect his friends to the point of actually suffocating and or harming those he tries to help. Of course his friends, colleagues, and past loves all have a huge impact as well. But im sure they will be covered in later posts. So to sum it up, I think your right Christine. Matt is happiest when he is being DD. When he is living up to his father’s wishes and releasing his inner adrenaline addicted self onto the world. Matt is a talented and driven man. He won’t feel fulfilled and happy unless he can utilize all his gifts in a pursuit in which he sees as making a positive physical difference in the world. Interesting the idea that he is active to push through depression. I just finished watching the documentary “The Roosevelts: An Intimate History” by Ken Burns and in it they said that Teddy Roosevelt had depression and the only way he found to get past it was to exercise, push through and always stay busy or moving. With the thought that the DD identity was born out of Matt’s need to self relies his talents and fuel that inner adrenaline junkie self. Do you think Matt still would have become DD if his father was never killed? The seeds of the DD identity were certainly there before his father died and it may have come through in a different way (I think they might have done a what if story about this with Matt becoming a SHIELD agent, but It might have been under different circumstances its been awhile since I’ve read it), but Im not sure it would manifest as the guardian superhero it became. As I mentioned above I think the DD persona is to linked to honoring his father and his left over feelings around him, but certainly mixed with earlier feelings of resentment and being typecast by others. Anyway just a thought that accrued to me and I thought I would shoot it by you guys. Just to stir the conversation.